How Google and MSM Use “Fact Checkers” to Flood Us with Fake Claims | Watts Up With That? An important figure or organization on the Left is caught doing something wrong, saying something outrageous, or blatantly lying. The Left injects into public discourse an absolutely fake, but believable, account of this action and immediately “debunks” this account. The fake narrative is accepted by the public as truth because the public knows that something similar has happened. The immediate debunking is rejected as a cover-up attempt. Later, when people accuse the original wrongdoer they use elements of the fake narrative. This is when “fact checkers” jump on them. Fake news networks accuse honest statesmen and commentators of spreading fake news. The liberals’ conviction that the conservatives are stupid and uninformed gets deeper. Google buries honest pieces far from public sight. Facebook tries to prevent their sharing. Leftist politicians cry that they lost elections because of fake news. A rhetorical technique commonly employed by anthropogenic climate change deniers to diminish climate science is to reference fears some scientists had over the prospect of global cooling in the 1970s. I don’t know when Snopes published that, because Snopes had its history erased from archive.org. Archive.org (that calls itself the Wayback Machine) is an Amazon-owned service that stores copies of web pages and sites for posterity. Some pages and sites are not stored because they are not popular, are forbidden to crawlers, or are hard to save. But Snopes.com “has been excluded from the Wayback Machine.” Snopes.com is the first website I encounter that has been excluded. That means it has forbidden archive.org to crawl its site and demanded to take down already saved data. That makes sense. Snopes is a fact checker – it checks facts to ensure they match the party line. In such cases, the party line is usually thin and changes frequently, so Snopes does not want 3rd parties to keep the history of changes. Think Orwell, 1984. But everyone who lived through the 70’s knows that any climate worries at the time were about cooling, and many know that one 1977 Time issue reflected these worries. Some climate realists googled the cover of that issue, and what they found was a fabrication. Not aware of that, they fell into the trap and posted this fabricated picture as a proof. Even the website of Dr. Roy Spencer fell a victim. Then, climate alarmists had a joyful and profitable time “debunking” the forgery they and/or their accomplices had created. This trick has been repeated multiple times with other arguments, convincing the majority of onlookers that climate realists are liars or simply ignorant. 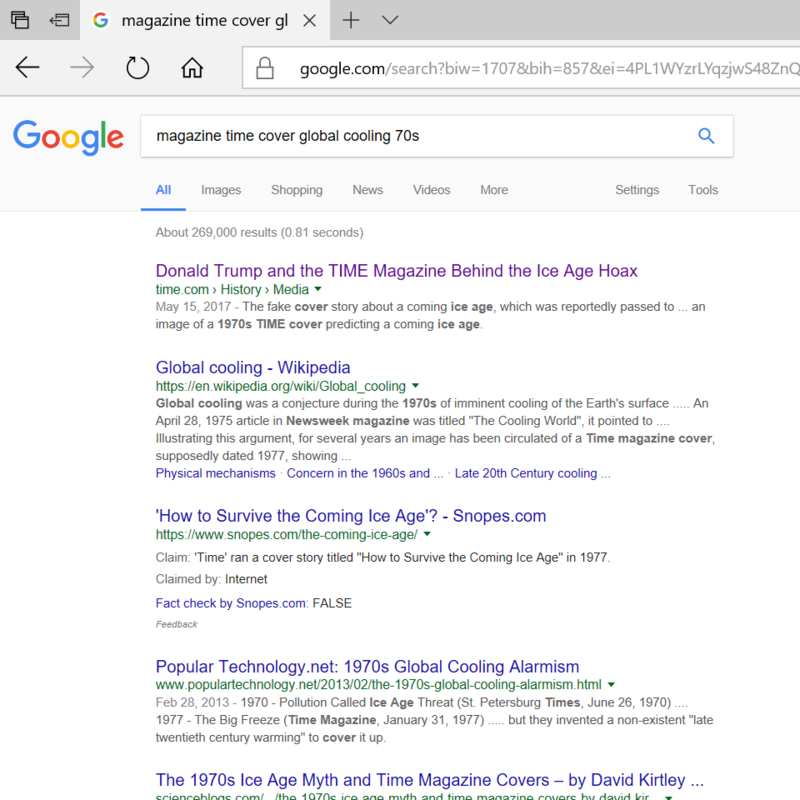 The first Google search result says that Donald Trump is behind the hoax, created by the Time magazine four years ago, and links to a fresh Time article (6), repeating and amplifying the hoax. A Wikipedia entry (7) is the second result, and Snopes comes third. Snopes result is “fact-checked” by Snopes itself. Thus, Google simply cons a user with its “fact check.” This is a recurrent occurrence, not an exception. Google knows that Snopes is untrustworthy from the fact that Snopes has expunged its history form archive.org. Snopes is also known to be hyper-partisan, but so is Google, and it might be excused for taking their political alignment as an evidence of objectivity by Snopes. Google also knows that it is a search engine, and fact checking is none of its business. Of course, this fact-checking by Google and some “social media” websites is nothing but a political censorship. Google is a monopoly created by the Obama administration through failure to enforce anti-trust laws, and then through subjecting the Internet use of 300 million citizens to the Title II regulation for the benefit of Google and other content providers. I dare to say that through Google, Facebook, and some other hand-picked corporate favorites, the Obama administration attempts to control our speech from the grave. I guess that climate alarmists launched this specific misinformation operation in response to the Global Cooling Compilation article, published by Anthony in March 2013. The WUWT article featured the correct 1977 Time cover. 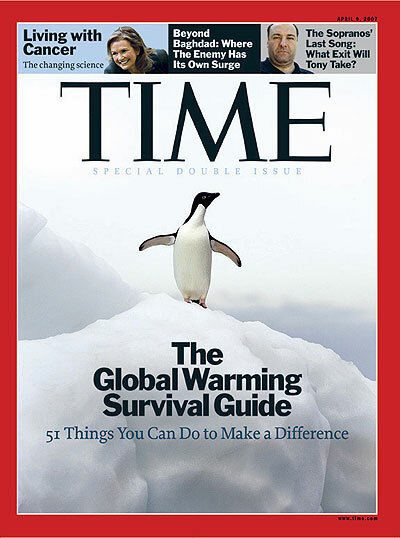 It turns out the Time magazine cover “How to Survive the Coming Ice Age” is a photoshopped fake. However, while the cover is a fake, Time was in fact printing stories about fears of global cooling in the 70’s. See here. And so was Newsweek. See here. And the National Science Board. See here. And Science. See here. And several other sources summarized here. We regret the error of putting the fake Time cover up. However, the point we were trying to make remains valid. The post is still there and contains links. It’s impossible to say from the text whether the photoshopped cover was the same as the one published later by Time. Most important: the post was dated by April 12, 2012 – more than a year before Time magazine published its Time-2013-version-of-1977 forgery. It is easy to verify the page on UncommonDescent.com has been saved in archive.org on April 19, 2012: https://web.archive.org/web/20120419223508/https://uncommondescent.com/intelligent-design/time-cover-fake-1970s-global-cooling-fears-not/. The “original source” of the fake cover is hard to trace. It is almost certainly somebody in the climate alarmism camp: the real cover from 1977 was very clearly making a point against climate alarmism. But the point of entry of the forgery into mass circulation was Time magazine, June 6 of 2013. Good job, motherf*ckers. This is not an outlier, but a repeating pattern. The most damaging case is “uncertainties” in the predictions of complex climate models. Of course, real scientists, physicists and mathematicians, used to say that there were “uncertainties” in the predictions of climate models, but only out of politeness. They really meant that those models were bullsh*t.
I could not believe such things would gain traction in a free society on such scale, and I still don’t believe. It might be that the U.S. was not a free society in the second term of the Obama administration, and that the remnants of the Obama regime have been in #resistance since the unexpected defeat in the elections. In the next two days, a Google lawyer will speak to the Senate Intelligence Committee and will attempt to steer its attention to a non-existent “Russian collusion”. He or she will lie and present cherry-picked or outright fabricated “evidence.” If the government wants to know the truth about extent to which Google aided foreign powers to interfere in the US elections and politics, it should not listen to Google representatives, but to send FBI to physically enter Google’s premises, to copy all of its code and data, and to start interrogating executives and sysadmins (after obtaining an appropriate court order, of course). In this example, multiple entities are involved: Google, Snopes, Time magazine, and ScienceBlogs. They are independent entities, but each of them knowingly plays its own well-defined role in the chain of injection, amplification, propagation, and utilization of a lie. Thus, they might be referred to as a single body. The Flooding Fake is different from a strawman fallacy. The Flooding Fake is a political operation, rather than a fallacy. Accordingly, in a strawman fallacy, the strawman is not disseminated outside of the original debate, and does not convince the opponent. The Flooding Fake is disseminated very broadly and eventually takes over some opponents. The Flooding Fake is related to two other PR techniques of the left: fake opponents (like “fossil fuels interests”), and fake debate subject. Another example of the Flooding Fake at work is the funny meme Al Gore – the inventor of the Internet. In fact, Al Gore pretended to be much more, almost a Creator of the Internet [link]. I did not check who was the first to utter that meme. It might have been a misspeaking analyst or politician on the right. But the “first source” does not matter because it is not broadly read or viewed, if at all. What matter is who injected the fake meme into the broad circulation. October 30, 2017 in Fake News, Politics. Most “fact checkers” are partisan hacks. Politifact is notorious for excusing the Democratic Part, as is the WaPo. “This is not an outlier, but a repeating pattern.” Sure. It works. Whatever Time Magazine et.al.have done since ,i remember the 1970’s reports in the press of an approaching ice age ,I believe it was a conjecture/ hypothesis of someone called H. Lamb,who was initially interested in historical climate research. Your memory is good. Prof. Hubert Lamb was no small fry, either. He was the founder of the UEA’s Climate Research Unit (of Climategate fame, and later led by Phil Jones). Prof. Lamb was, indeed, very outspoken in his warnings of the coming “ice age” (really, reglaciation). Leftism is an ugly ideology,which Democrats keep embracing,despite that it is full of crap and lies. It is hostile to America and to freedom. I left the party way back in about 1990,when I realized that Classic Liberalism, was being replaced by Leftism. Nationalized Socialism is a failure everywhere,but Leftists don’t care about that. I lived through the 1970’s aware of the loud concerns of the cooling and powerful winter storms of the time. Leftists like William Conolley tries hard with his lies,to sweep away the evidence that science and scientists of the day were indeed growing concerned about it. I’ve lost track of the number of leftists who believe that this time it will work, because this time they are going to be in charge. …you mean Hillary didn’t win???? Let me check with Snopes on that. The Google link mentioning Trump does not say Trump created the hoax, but merely that it reached his desk. It is beyond leftism. It is blatant marxism now on both sides of the pond and other than climate hysteria they constantly whip up fear of the dreaded right wing, the far right, the extreme far right, even the ultra far right all kept constantly in the public domain always hoping a nut job will appear somewhere to be their Patsy. The simple question all people should ask is, do we want an ideology which has failed everytime it has been tried? Which leaves countries devastated and its own population disappeared? Look to Russia and China in the 20th Century. 100 million dead and a large number of those their own people whose crime was they did not conform to the religion! And now, are we really worried about a few skinheads and the occasional token nutjob? +1 I’m amazed more people don’t see this. The millions were murdered because they were deemed “The Deplorables” and the government has the power to do that. In Europe there are three political groupings. Communists, Socialists and everyone else is far right wing. I am irritated whenever I see it written that the average person is politically to the right of center in the US. Huh? Who determined what the ‘center’ is? Shouldn’t the center by DEFINED as the politics of the average person? These people are actually hiding the clear truth: THEY are to the left of the average American. They are NOT the center! The terms Left, Right and Center refer to political beliefs, not to the number of people who holds each view. In the US, historically about 20% of voters willing to state their political beliefs identify as liberal, 40% as conservative and 40% as moderate, give or take from each category. Thus, if moderates be considered as Center, then the “center” of US political opinion is Center-Right. Have tougher with you and it is getting nastier and nastier as the Left adopts ‘identity politics’ as the norm, a development that is as anti social as one could imagine being essentially about creating a series of ‘identity’ subclass’ that take priority over nationality or other practical community constructs. I term this ‘Wahabi Socialism/Feminism/Activism’ as it seems to draw on the fundamentalist religious methodology and practice for inspiration. Ultimately though what it is really about is constructing an ‘elite’ who will run the place through fear, intimidation and arbitrary punishment. CAGW is just another front opened up by the ‘Einzatsgruppen’ ( that is how these people behave if you know the reference). What an irony that they call those skeptical of their half baked nonsense ‘deniers’. FUD ? Who knew . Thank you for this. I remember the 1977 cover well because I got into a raging argument in high school with people who believed it, though the science no more added up then than the CAGW science adds up now. Decades later, I went hunting for online copies of the cover to show other people, and despite being able to find many different covers from that era, I couldn’t find that one. Thank you! One wonders what one would find if one went to an old bricks and mortar library where they archive physical copies of magazines. Those would be rather difficult to “disappear” and blame on a hoax. I will go to a library to find that issue to make sure, but I remember the article related to the January 31 1977 cover being at least mostly about a weather event. The winter of 1976-1977 was the coldest on record in part, maybe most of the Northeast US and maybe nearby parts of the Midwest, and Buffalo had record snowfall. Snow was seen falling in Miami for the only time on record. While I am at it, as mentioned by the Google link mentioning Trump (which *does not* claim Trump created the hoax), Time had an article on “another ice age” in June 1974. Check for June 24, 1974 also. My recollection is that there was a big article in that issue about global cooling, don’t know if it was on the cover. April 28, 1975 Newsweek is another I’d dearly love to have a copy of as they also ran a global cooling alarm article in that one. davidmhoffer: I meant to say June 24th, the date you mentioned, as being the issue that had the article about “another ice age”. I found that out from the Google link shown above mentioning Trump. Correction, that is the 2007 cover, which was photoshopped to pretend to be the 1977 cover. Nick, you are right. The fake 1977 cover is not a real 1977 cover. You should consider reading the post. And another correction – red face this time; the date on the freeze photo is 1977. I was thinking of the Archie Bunker cover of 1973. But the 1977 cover is not a global scare story. It is just about current weather. And another correction – red face this time; the date on the freeze photo is 1977. It wasn’t the only one. There was at least one other cover I remember which had a story in the upper banner (similar to Living with Cancer above) referencing global cooling. Don’t remember the year, but I do remember the issue. It may have been the one I was thinking of rather than the one in this article. Couldn’t we just have an automated script? Jeez, Nick, you are a brilliant piece of work. that is the 2007 cover, which was photoshopped to pretend to be the 1977 cover. That is a bad joke, not a real forgery. 1977 and 2007 differ so much graphically. Exactly what I was thinking David. When I was doing research for papers in college, I remember looking up articles in old issues of magazines in my local area library during my research. They had the issues of major magazines going back decades, but that was in the 1990’s. I will hazard a guess that most libraries today in the larger urban areas have all the old magazine issues archived (on microfiche perhaps, if not the actual paper copies) going all the way back to the 1970’s at least, and maybe further. I imagine it would be pretty hard for Time to somehow get rid of all of them at every library across the country. At any rate, George Orwell’s history-rewriting Ministry of Truth would appear to be very much alive and well here in 2017. His novel is supposed to be a work of fiction, not an instruction manual. Sometimes in the back dusty corners of old 2nd hand bookstores, and flea markets, one can still find paper copies of old issues. Getting rid of every trace of the lie isn’t important. What matters is that the h0ax is put in motion and sufficiently amplified my the media and associated machinery until most of the proles believe it. This is Dr. Goebbel’s legacy. I remember that time, too. Human-caused Global Cooling started appearing in the literature, and I had no reason to doubt the scientists knew what they were talking about, and I was eager to see what they had in the way of proof, but I remember becoming frustrated as time went along and no definitive proof was ever provided. Lots of claims but never any proof. Then it dawned on me: They didn’t have any proof! They were blowing assumption-filled smoke. Then when the late 1970’s came around and the temperatures started warming up, some of these same scientists starting promoting Human-caused Global Warming, again with no evidence to back up this claim. I, of course, didn’t believe their claims because I had become a skeptic by then. And to this day, the Alarmists have not provided any proof that humans are causing the climate to do anything it wouldn’t normally do. I dropped my subscriptions to Science News and Scientific American sometime in the early 1980’s because of my disgust with the magazines for promoting a theory as settled science when it obviously wasn’t. Science News also published articles about Global Cooling before they published articles about Global Warming. It was very surprising to me back then to understand that the people writing and publishing these CAGW articles were basing everything they were doing on assumptions, with no evidence to back the assumptions up. It looked pretty clear to me, but not to them. Not much has changed all these years later. Lots of assumptions but no evidence. Envirostalinists hope that humans have memories comparable to fish. Organised underhand tactics, censorship and manipulation do seem to infest the Global Warming space. I have seen it myself. Sometimes it is even predictable, prod the beast in the right way and you could almost copypasta it faster than they do. Shining a light in all these areas like this article is very important. I used to rely on the archive /wayback systems a fair bit. We now know they cannot be trusted. Ideally we could do with a truly uncensored reliable and trustworthy repository of stuff which is open access for all . It would be very useful as research for the future. This would need to be done professionally, will need good security and backup not lest to be immune from some left wing activist who works in the data centre and knows which is our server. You will probably also need a full time IT specialist as its going to be DDoS attacked every single day! Best thing would be to start crowd funding some of this. I think the very existence of a few crowd funded things for anti-AGW right wing stuff should of itself generate a few exploding heads, which can only be a good thing. Liberals, or progressives (named by themselves as accurately as the Elder statesman Kim coined the name “People’s Democratic Republic of Korea”), are rapidly emulating the Ministry of Truth from Orwell’s 1984. While chanting “the end justifies the means”, they lie, cheat, alter data, and then accuse heretics of the very ethics crimes they are perpetrating. The first casualty of war is truth. And make no mistake, liberals have declared war on all dissidents to their agenda. They have no intention of coexisting in peace. They want all non-liberals converted or somehow eliminated. Don’t believe me? Then ask yourself why they idolize Stalin and Mao, socialist leaders who exterminated tens of millions of their own citizens for daring to disagree with them. Isn’t the “People’s Democratic Republic of Korea” a socialist state? In which case, it’s the longest lived socialist state ever. Kind of says something about the ideology which is that the way to make everyone ‘equal’ is to make everyone poor. I’ve often read about Snopes, but the first time I specifically went to them was recently, about Al Gore’s claims to have “invented the internet”. Even their own quotes indicated his attempts to claim credit, but they then semantically tried to pretend that he didn’t and that it was a false claim. I’m not going back to Snopes again before the sun goes cold if I can avoid it. Snopes is and has long been a clearinghouse for leftish propaganda. If there was any doubt, it was settled during the last Presidential race, even before the primaries had started. As correctly reported by the fac t cheackers. Thanks but I’ll go to a library and check a paper copy, don’t trust anything on the internet to which Google-FBI fabricators have access. As noted above, I misread the date, thinking of the similar Archie Bunker cover of 1973. But the 1977 cover is not associated with the 2007 penguin cover, and was not about global cooling. And I have the penguin dates the wrong way around. It’s a 2007 cover, which was photoshopped to appear as a 1977 cover. You have ALL of your facts wrong. I read Time magazine back then and I remember the article well. It was about the coming ice age. It’s a straightforward account of a snowy period. Yes, Nick. Even back then people were confusing the weather with the climate. Co2isnot, in those days the best cruisers for the snow were Toronados and Rivieras. They could walk away from any rear wheel drive without studded tires. They even were heavy enough to pull out small cars. Time-less, Pop. But old enough to remember the cooling non-scare. Please also see the scientific papers and popular press pieces cited below. Nick, the “Cooling” meme was quite strong in the early ’70s and extended well back into the ’60s in the US. Where I was raised we used to see snow exactly once a year, usually no more than 4 inches (10 cm for the non-Imperial lot). Then, just after high school, there were a series of three very cold years in a row. I recall seeing icicles linking my pickup to the ground that had formed since I parked there three hours earlier. I realized that while the sun was warm enough to melt snow, in the shade it was still below freezing – at 2:00 pm. There were several snow storms that year, then the following year no snow at the old homestead at all. That remained true for a decade and then just as the press was picking up a “global warming” theme, it started snowing about once a year again. Just five years ago we lost a 300-year+ old Valley Oak to a sudden dose of over a foot of wet snow. Several books took advantage of the “coming cold” meme of the ’60s and ’70s. I have Climate and the Affairs of Men by Winkless and Browning on my shelf right now. The argument highlights solar influences and offered extensive historical support to a possibility the planet was descending into another cool period. Even earlier Robert Silverberg published a “teen” Sci Fi – Time of the Great Freeze, that leaned on the return of a new glacial epoch. Poul Anderson published his Winter of the World in 1976. One useful sociological trick is to consider themes in fiction. Just as at present there are a glut of “environmental” stories often assuming some form of extreme global warming, back then “ice” was a popular worry along with nuclear war, which latter tended to overshadow other concerns. I recall global-cooling and the impending ice-age was all over the media in the UK too at that time. It’s amazing how many people clearly remember the hoo-haa that is now denied to have happened by those promoting the global-cooking agenda. Of course, it can also be claimed that it was mostly just due to journalists inflating the already exaggerated claims of the ignorant publicity-seeking scientists. But the same is still true today. I’m sorry, but “The Sopranos” didn’t premiere until 1999. Thus, this isn’t likely a genuine Time cover of 1977. Not to mention the ‘surge’ in Iraq. The cover I showed is the genuine 2007 cover. The pretend 1977 cover is the one shown in the top posts, which replaces this with ads for M*A*S*H etc. The article explains how the marxbrothers did this Nick and charitably I’m going to give you the benefit of the doubt that you were truly bamboozled by the chicanery of the neo-liberals. I generally find your contributions at least scientifically literate, but, like a lot of genuine scientists, you are naive in the manipulatory ideological sphere. I used to be, too, in the early part of the nine decades I’ve sampled. I remember long before the indisputable global cooling alarm, my parents and their friends talking about the hellish heat of the Dirty Thirties (born in them but no memory – the war soon changed the conversations). Every state (and Canadian provincial) heat record remains from this era, a chain of them still hotter than today – and these corroborated by the longest series around the NH and in South Africa and Latin America (Paul Homewood files). It certainly is easier and more profitable to go along with the fun, but in the end, simple truth matters. You have to live with yourself. The date on this one is april 9 2002.???? In an article that details the tricks the so called “fact checkers” use to distort the truth. Nick declares that the fact checkers must be believed. Stokes, are you contemplating a career change to comedian? Cause you are off to a rollicking good start. I occasionally go to Snopes. I checked a story on Hillary (trying to be fair) and Snopes “debunked” it by . . . asking Hillary. Take anything they say with a boulder of salt. Snopes was leaning heavily Left for a long time, but of late, I have noticed that they are now using a lot of “stringers”, and their slant has become more obvious. In other words, snopes is completely unreliable on any controversial subject. Truthorfiction.com is much better. In addition to the what you relate about a Hillary story, snopes “debunked” a story on John Kerry by quoting his “official” biography. Another favorite tactic is to add something to the original story that was not present, then they “debunk” the addition and label the whole story false, even though the original story may have been completely true. One enough people have seen a distorted version of something they had personal experience of, being purposely misinformed by someone will be jokingly referred to as “being snoped”. I had that experience with “60 Minutes”. They reported a couple of stories that I happened to know a lot about. In both cases the reporting was nothing close to the truth. sorry, macgregor, but that goat don’t hunt. 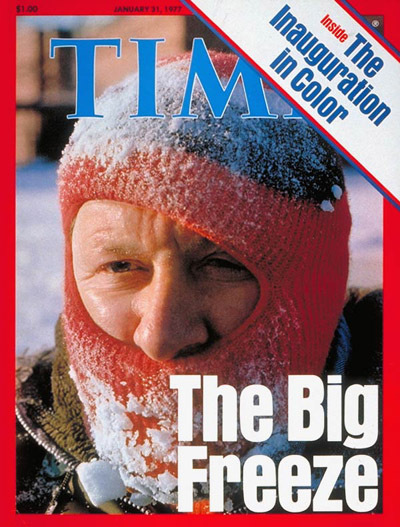 Interesting that the left recognise the global cooling story as important enough to devote quite some effort to fabricate disinformation and fake 1977 Time covers. And TIME themselves complicit? Quite an eye-opener. The Left, like good Nazis, thinks their opponents are evil. When you are fighting evil, ANYTHING is acceptable. Lying, cheating, stealing, murder are okay when fighting evil. Time magazine still exists? and still has gullible paying subscribers? That’s news. I saw a copy in the doctor’s office last week, and marveled at how thin it was- almost NO ads- it was less than twenty pages but still was replete with slanted, bogus stories. Come to think of it, I think it WAS an issue from 1977. Tony Heller has stuffed NCAR’s graph from the Newsweek story down NOAA’s gaping maw, to show how blatant and shameless has been the agency’s perfidious, mendacious manipulation of “data”. Part 2 and 3 are in the posted link. There are over 250 published papers,that William “proof reader” Connolley amazingly missed. You still laughing after you learned you have been LIED to? And you should know better than to trust trough-feeding NOAA bureaucrats and rent-seeking academics whose careers require spreading CACA lies. The news articles of the 1970s quoted leading academics and government “scientists” at the time, many of whom later switched sides and hooked their wagons to the new rising star of “global warming”. Were you alive and in academia in the ’70s? Meanwhile Ralph, were you around in the 1970’s when HUNDREDS of media reports were about the cooling at the time? Science, July 1971, published a paper by S. Ichtiaque Rasool and Stephen H. Schneider, titled “Atmospheric Carbon Dioxide and Aerosols: Effects of Large Increases on Global Climate”. Leading atmospheric scientist Dr. Rasool, of NASA and Columbia University, then predicted that “the world could be as little as 50 or 60 years away from a disastrous new ice age”. I could cite a number of other well-known “scientists” who switched. GHE of more CO2 is logarithmic, so no worries. More aerosols, however, watch out! Whatever people do, it’s bad! And we need to stop by smashing capitalism! Effects on the global temperature of large increases in carbon dioxide and aerosol densities in the atmosphere of Earth have been computed. It is found that, although the addition of carbon dioxide in the atmosphere does increase the surface temperature, the rate of temperature increase diminishes with increasing carbon dioxide in the atmosphere. For aerosols, however, the net effect of increase in density is to reduce the surface temperature of Earth. Because of the exponential dependence of the backscattering, the rate of temperature decrease is augmented with increasing aerosol content. An increase by only a factor of 4 in global aerosol background concentration may be sufficient to reduce the surface temperature by as much as 3.5 ° K. If sustained over a period of several years, such a temperature decrease over the whole globe is believed to be sufficient to trigger an ice age. Consider thinking on ECS for CO2 at the end of the decade, as embodied in the 1979 Charney Report. At that time, there were two estimates. The scientific consensus, as shown by the Science paper cited above, was exemplified by the sober estimate of Manabe, father of the GCM, at 2.0 degrees C per doubling. The crazy WAG by wild-haired Venusian Hansen was twice that amount, at 4.0 degrees C. Charney combined them to derive the now “canonical” range of 1.5-4.5 degrees C, with a central value of 3.0, by adding an arbitrary error range of half a degree. Despite having no scientific observational basis, that hypothetical range has remained unchanged for almost 40 years now. Hansen was even then planning on making a career out of global warming alarmism, based upon his bogus “work” on Venus. Actual observational evidence shows that the real range is more like 0.7 to 1.7 degrees C, centered on the lab measurement without feedback effects of 1.2 degrees C per doubling. Since net feedbacks are more likely than net positive on a self-regulating water planet, below 1.2 degrees is probably closer to the mark than above it. Then, he said that we were already headed toward the next ice age, and have been for 3000 years (which is true, since the Holocene Climate Optimum, Egyptian and Minoan Warm Periods were the triple peaks of our interglacial’s warmth). Not that Dr. Rasool predicted doom in 50 or 60 years, just as Warmunistas like Mosher do now. The End is always in a future just close enough to be worrisome but too far away to affect the doomsayers’ careers. If finer smithereens be required, they can be provided. I’m glad Tommy was on the case, too, though, because I forgot about those two excellent compilations to which he linked. Please also see my replies to Nick above re. US government embracing of the threat of global cooling, based upon the best “climate science” then available. Lamb, H. H. (1973) Is the Earth’s Climate Changing? For the past 30 years the temperature of our planet has been steadily dropping. The UNESCO Courier: a window open on the world; Vol. XXVI (8/9), 17-20. By no less an authority than Lamb! How can commenters here possibly claim that scientific papers from the ’70s didn’t raise concerns over global cooling? Lamb cites guesses of 3 to 4 degrees C per doubling of CO2, but his own observations of global cooling from the ’40s to ’70s belie those inflated figures. CO2 increased just as dramatically as the world cooled during those decades, the falsifying AGW. Two Thumbs, way way up, Gabro!! Professor Hubert Lamb, first director of the CRU at UEA in 1971, had previously led research into climatic variation at the Met Office. He was then known as the “ice man” for his prediction of global cooling and a coming ice age. He changed his mind after the famously hot summer of 1976. Little did he or anyone else then know that the PDO was in the process of flipping, so ~30 years of warmer WX and climate were to be expected. Is there any common network connection between these entities, Soros or Steyer, for example? The scary thing is in this digital world Orwell’s ” Memory Hole” is easily reality. Nothing really humorous about that at all. The skeptical side of the debate seems to be quite busy somewhere else to bother about small things. A big MSM like CNN has been publishing news recently that it is only US and Syria left out of the Paris agreement. A cursory check with the UNFCCC website will show more than 30 states have not ratified the Paris agreement. The pro-CAGW loves to accuse and ruin careers for failure to acknowledge “boiler plates” facts from Wegman and recently Steve of Climate Audit. If it was WUWT who missed one country out of the approximately 30 countries still out of the Paris agreement this will be a very big issue. There would be call for WUWT to be shut down for such an error. The CNN fake news is now an accepted fact. Unchallenged. signed & ratified is 2 different things. Per the UNFCC website, almost everybody signed. Most have ratified; per the website 169 out of 197, so 28 have not ratified. That same website (UNFCC) listed/included the USA as both a signer and ratifier…. Trinidad and Tobago have not ratified (and are only counted once … no statistical mischief there); they (it) must not be afraid of flooding (or they’re holding out fer a better deal). Just to see if the flooding fake is spreading to other countries and languages I went to google.ch and searched for “globale abkühlung 1970”. I wonder what results this search will produce in a year or two. Russians have in fact colluded with US green/red NGO’s to hold back or stop US energy production, particularly oil and gas. Tens of millions have been laundered into big name groups like the NRDC and Sierra Club who then launder it some more and give it to smaller groups to stop fracking and pipelines. RS the Russians are behind global warming for sure. Russia is the world’s most popular immigration destiny after the US. Which means 100s of 1000s of people emitting CO2 as they breathe. Can’t argue with that ! Immigrants to the US only breathe out ‘Liberty Breath’. I seem to remember a magazine cover, the statue of liberty with ice up to her eyeball with the top floors of the empire state building in the back ground. I believe it was a 1972 magazine. It would seem that TIME handles it’s past covers as Hansen and Gavin past temperatures…and Google and the MSM lets them get away with it. Time to visit a library to really find out about the past. So perhaps it’s more the case they only have to make up their minds when the news is relevant to them. I am so tired of people claiming that the early to mid-1970s scare over global cooling did not occur, or did occur but was confined to journalists, or some other variation of nonsense meant to bury the story. I was an adult at the time and can recall the whole episode fairly clearly. No less than the National Academy of Science engaged in a study and rather than dispelling the concern concluded the concern had merit. Absolutely true K.Kilty. I was an undergrad in Physics in the late 70s, not only was the whole subject the topic of much conversation among the students and faculty, we had snow in Florida, and sufficiently cold weather the campus iced up. In addition, it was cold enough for long enough that the school started trying to conserve energy as brown/blackout were happening, all the hallways in the buildings had the lights turned off, the building temps were set at something like 60 deg (brrr, I remember wearing gloves and a heavy coat to class), and the whole feeling was of an impending disaster, no power, lots shortages, etc. I still have strong memories of that winter. Of course, it soon returned to normal, which led me to take any climate story with a huge grain of salt the size of the Bonneville salt flats. The January 1977 cold wave? That was a memorable winter all over the US and probably beyond. Because PDO flip with a vengeance! Of course the PDO wasn’t discovered for almost another 20 years, by a PNW fisheries biologist, not “climate scientists” already then too busy cooking their computer games books with unwarranted assumptions to get the desired results, rather than studying the real climate system. It says we need to understand climate change and its reasons better. It does not promote a cooling scare. It is ambivalent on which way it will go. The ONLY thing man is changing is the local weather in urban habitats and the past climate data. The first sentence is unprovable, agenda driven nonsense..
By not reading, you just tread on the narrative. The NAS report was advanced as evidence for the global cooling scare. The preface starts with unprovable nonsense. It needs to be pointed out that nick stokes thought Mann’s hockry stick generator was real scientific research. He also thinks green house gase warm the planet, and he can’t understand the fact magic gassers’ so-called “calculations” of global atmospheric temperature can’t match the International Standard Atmosphere, which physical and regulatory standard, actually states the REA gobal atmospheric temperature. Guess this gives the science Den1er label a whole new perspective. Or is that maybe history den1er? Climate d@nier and history revisionist. They go together. Both in the same Stalinist pea pod. Interesting that H!tler gets you moderated by Stalin or Mao, spelled normally, don’t. If I recall correctly, the big save for the ‘coming ice age’ was Dr. Revell’s revisited theory from the late 1800s which suggested that CO2 and other carbonaceous gases might slow the cooling. When nature reversed the cooling, that became the first choice to explain why the temperature rose again, and the race was on to prove the idea was fact. Once Gore pushed it, Hollywood enhanced with Mike’s magically-merged mesmerization, the whole thing grew legs and became a truism, or perhaps an icon to believe in for those who loathe the human race outside of their own social circle. And Revell changed his mind yet again, but died before he could make unambiguous public pronouncements against Gore’s hijacking his earlier hypothetical work. Naturally, his daughter stuck to the Commie script and d@nied that he had recanted his CACA faith. The main differences between the 70’s and now is that there are ten times as many scientists working on climate, plus another ten fold in social science and biology jumping on the bandwagon. In addition, we have a far more gullible society with many that don’t understand freedom of speech and its importance. You also now have powerful super computers and GCMs that give more legitimacy to the arguments than was possible in the 70’s. But, in both cases, according to environmental activists, it was evil fossil fuels and capitalism that was too blame, mass starvation was predicted then as now (by the same people in some cases!). today, what is emerging is beyond any conspiracy theory. Leo, couldn’t an investigative search turn up authentic… what do they call those old ‘photo film’ records you used to be able to search in libraries, or old copies of real publications, or old journalists who wrote some of this stuff, or collectors. Oh yeah microfiche! I have an article by Al Gore in Scientific American magazine September 1991 issue. Subtitled “A high capacity network will not be built without government investment”. In the mind of a top-down liberal, the government provides the necessary support for all society’s wishes. My experience with the global cooling scare is as a young man in the late 1970s early 80s I was considering moving south (Northern Hemisphere) and emigrating to the USA, for the sake of my future family. All that worrying about the coming ice age and now I am supposed to be worried about the opposite. I wouldn’t worry about escaping Canada until the snow no longer melts in summer. Even then, you’d still have plenty of time to keep ahead of the ice sheets. To build up a three kilometer high ice dome over Hudson’s Bay would require 10,000 years at a third of a meter per year. The snow didn’t melt this summer on nearby Mount Baker. Should I be worried? Not until it no longer melts in Victoria. We’re in a shitload of trouble. Now you sound like my brother when we actually got grampa’s outhouse to tip over. Only a little off topic….when a couple of years back I got a ‘smart’ phone, I opened the browser and typed in watts up with that…I was immediately directed to ‘wottsupwiththat’ a response to climate disinformation. Looks like the debunkers actually pay to put their stuff ahead of legitimate searches! ‘wottsupwiththat is a failed website aimed at ‘debunking’ this one. You will not learn anything about the climate there but there are plenty of insults aimed at Anthony Watts and anyone else challenging the global warming religion. wottsupwiththat has not been updated or had a post since February. Maybe ‘Ben’ is saving up his insults for the big one. 1970’s global cooling scare has been immortalised as ‘Nuclear Winter’. The global warming scare is so dumb it might be easier to erase. But this might be the right time to backup WUWT content anyway. When you see the spokesmen/women for these organizations gathering with politicians who praise and employ this kind of behaviour and their owners donating millions to further kleptocratic causes. It is not hard to accept the possibility that they share the ethical defects of their comrades. I don’t think the governemnt is supposed to break up monopolies if that’s what Google is. It’s easy enough to stop using it. If people are too stupid to stop using it, the government isn’t going to fix anything. Government creates monopolies, and the ones they don’t create are normal. I am sensing some anti-capitalism. I am pro-Google and am not under any circumstances selling my shares. They are a miracle company. Did something very few are capable of doing. Any shenanigans used against Google will be used against Exxon-Mobil some day. I am pro-huge Godizilla sized big oil corporations as well. And you may or may not be surprised how many people believe that result. Afterall, Google can’t return fake search results, can it? Do I need a /Sarc off? I lived through the 1970’s cooling claims by scientists in the UK. It was consensus then. Every science program on TV (Which I didn’t have too much access to. It was the library for me mostly), radio, newscast/papers claimed we are doomed to a frozen planet unless we do…something *THEY* said we should. Yes, CO2 from fossil fuels was the problem then too. The UK where I lived, not far from Biggin Hill, was very cold in the 70’s. I loved it when young. Snow and iced pavements to slide on. Not too long after, “scientists” were all proven wrong. The issue I see today is the depth alarmism can penetrate “consumers”. In the 70’s there was no such thing and instant access to “news”. Today, we are flooded with it. Billions have access to an internet connected device that can record videos and, instantly, “upload” and allowed to go viral across the world MSM sites. That didn’t happen in the 70’s because it was just weather. Now, it’s climate! Snopes is a worry. I’m not trying to push a conspiracy theory about Paddock but surely a little more integrity is required from a fact checker. The first is a section of the first photo in the article and the second is a section from a different picture in the article that zooms in on Paddock’s ear. There is a very distinct neck outline until it gets close to the ear lobe in the second. Would those with more expertise in photoshopping like to comment? Snopes is an essential and accurate tool: always check any story on it. You have to remember that Griff’s definition of truth is anything that he agrees with. Snopes as biased as hell. Go to the search and type in Quantum Mechanics (1 Page: 2 entries) or Gravity Waves (1 Page : 4 entries). Now try climate change (9 pages and it goes on and on). So Griff wants to use a site to referee science with that clear and obvious bias to everything that isn’t science. Only in the planet of Green Left Loons does that fly. And you’re a truthful and accurate poster too, I suppose! You really are a piece of work aren’t you, Skanky, you mendacious, slanderous little propagandist? Or anything he’s just made up on the spur of the moment. Griff thought the green house gases warm the planet, too. Another idiot in an idiot’s church. i think journalists simply beleive greenpeace say and green GNO the Truth. They simply don’t check they simply don’t want to challenge them even little scared of theirpossible reactions. Even it is not true even if it desn”t make sense don’t challenge green church. I’m big on ‘tells’. The naivety of the neo-left is the having to be never mistaken. Now a cunning chap like me, were I to turn my hand to this ficto-history game, would here and there among the BS products would admit to having been wrong on occasion to establish my bonafides as a reliable abd transparently honest, self-deprecating servant to truth. I’d certainly be recognized as such by (apparently) the punters in this game. Those from Missouri would still get me of course. I remember him being interviewed on talk radio. I read Ponte’s book three times. Much of it made sense to me at the time. In recent years, I’ve read several other books on “Climate Change,” and follow the subject regularly online. It seems to me that anyone who does his/her own research, will come to question AGW. Is this site fact checked? No is that necessarily a problem: we shouldn’t expect sites like this to have professional fact checkers. which means that some fake information is removed. It really is funny how much faith Griff has in his co-religionists. Griff is funny the number of times I have had to pull him up on facts. Tell us about the wind turbines building in India, Italy going out of coal and the poor drowning polar bears … did you fact check all those? I should say Griff I ran across a response by the Italian power grid operator to a 2030 coal phase out and the new 2025 phase out. “Italian power grid operator Terna responded to the 2030 plan at the time by saying the country should “increase gas-fired capacity by at least 1GW to guarantee flexible dispatchable capacity without destabilising the Italian system,” and added that meeting the 2030 phase out deadline “would require another 2.4GW of gas-fired capacity and another 1GW interconnector between Sardinia and the mainland.” This new 2025 pledge is likely to require even more investment than that. A final strategy is expected in November 2017. No renewables to replace it and with the infrastructure they require to build that will be a tight timeline. A new gas power station of that size typically takes 5 years assuming all the site planning has been done. It doesn’t do any good, he posts the same lies over and over and over again, no matter how many times he’s proved to be telling porkies. It is more so than The Guardian for instance. The basis of much of this lies in intolerance and the hubris of confusing opinion and fact. As lefties devolve into mob thinking we will see more of this and much worse. Uncommon Descent isn’t a conservative blog. It’s a creationist blog. Very good post and education. It reminds me of the short con long con game supposedly used by governments and nefarious others I read about a few months back. And, ultimately the rest of the commercial environment playing games with the population for cash. Huh. I always thought political ‘fact checkers’ were those who ‘checked’ or ‘blocking’ the facts before they became public. Hmmm. Y’know, I still think so. This is why ScienceBlogs and Time magazine produced and disseminated their fabrication. It isn’t the correct cover of Time. That article is about the cold winter of that year, and has nothing to do with global cooling. And the story about Time or Scienceblogs creating it in 2013 is nonsense. Here is one occurrence in 2010. And here is none other than Steven Goddard in 2011. This is getting close to the origin. Free Republic, August 2007 has a gif which switches between the genuine Apr 2007 cover and the photoshop. Mueller needs to go Elephant hunting instead of fly swatting . A $Trillion dollar fraud has been pulled on the American people and continues today . The great global warming fraud industry is built on purposely inaccurate science and promoted by conmen who view taxpayers as their personal piggy bank . Certainly do the EPA red /blue team analysis but then start jailing the perpetrators of the biggest fraud in history .